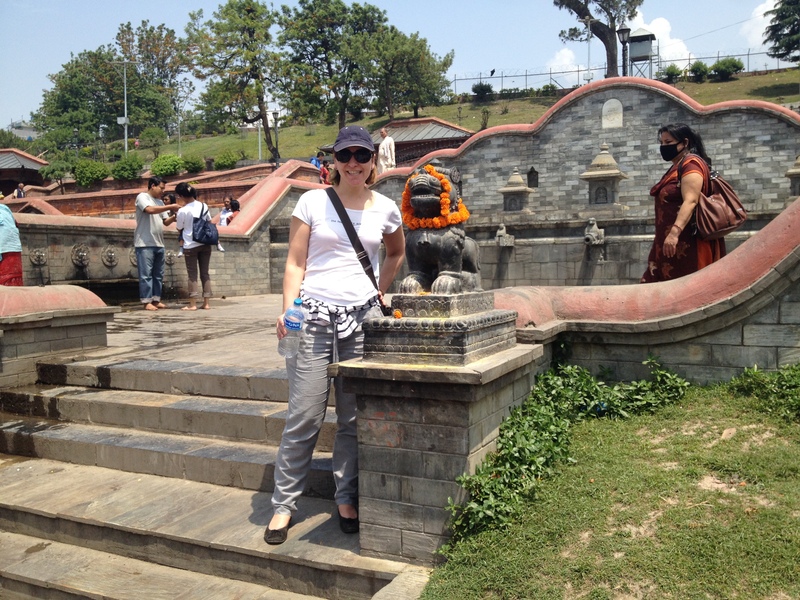 After a good night’s rest we met our guide in the morning to visit another stupa, this time Boudhanath. 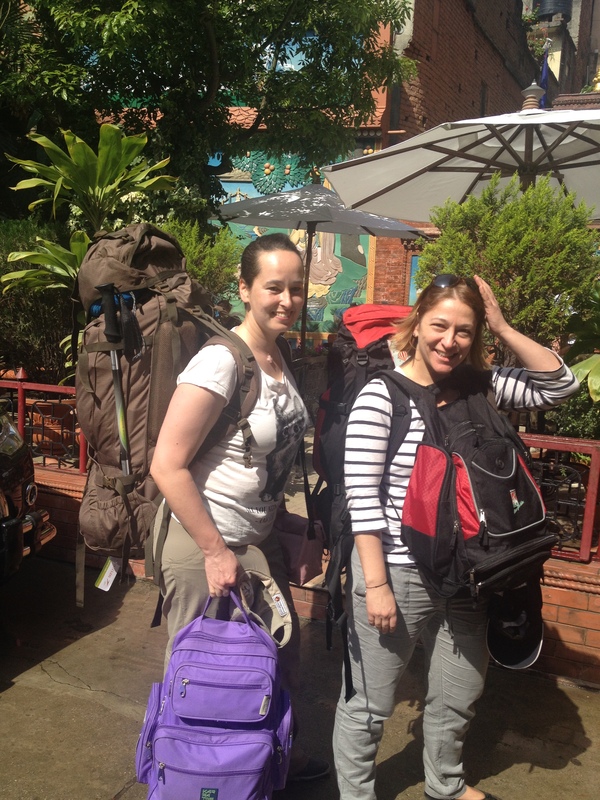 But first we had to come down with our backpack. 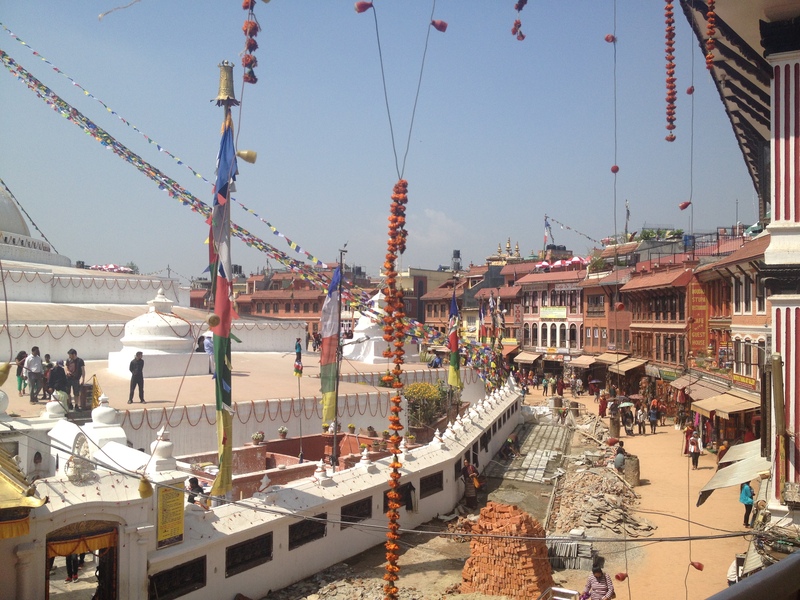 The Boudhanath stupa reminded me a lot of Sienna, just instead of an empty space there was this huge Buddha pilgrim site. While we were drinking coffee in a rooftop café we watched some guys preparing the stupa for the next full moon festival. 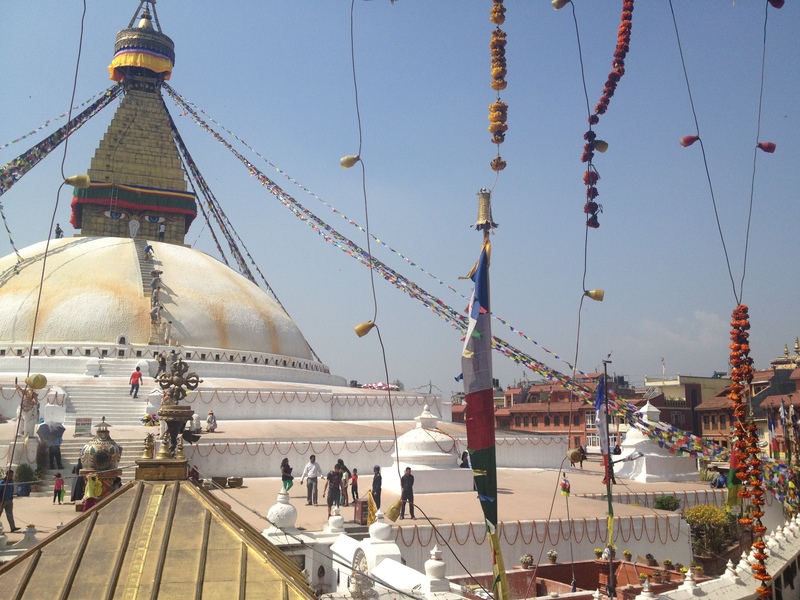 For this occasion they beautified the stupa with yellow arches which resembled the lotus flower. All this was done in Jackson Pollock style, with a flick of the wrist the color was thrown on the stupa. 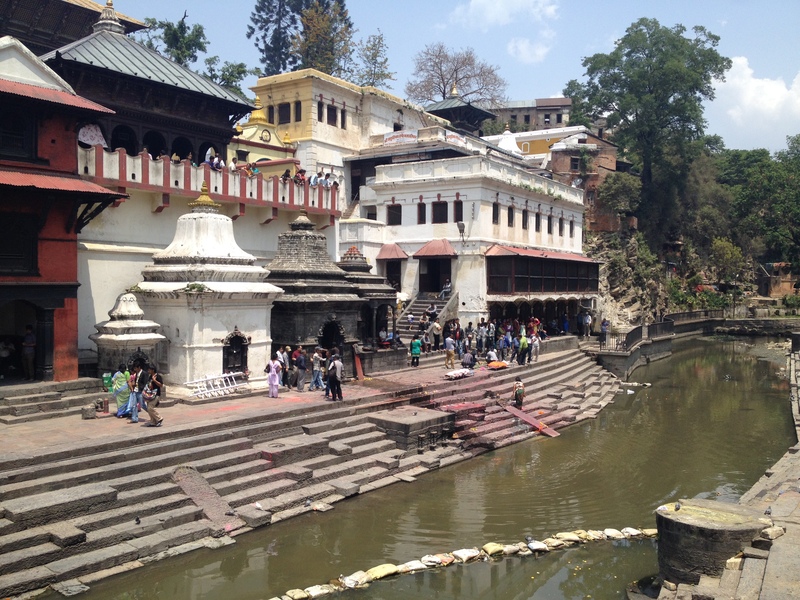 From the stupa we drove then to Pashupatinath Temple, a sacred Hindu temple on the banks of the river Bagmati. 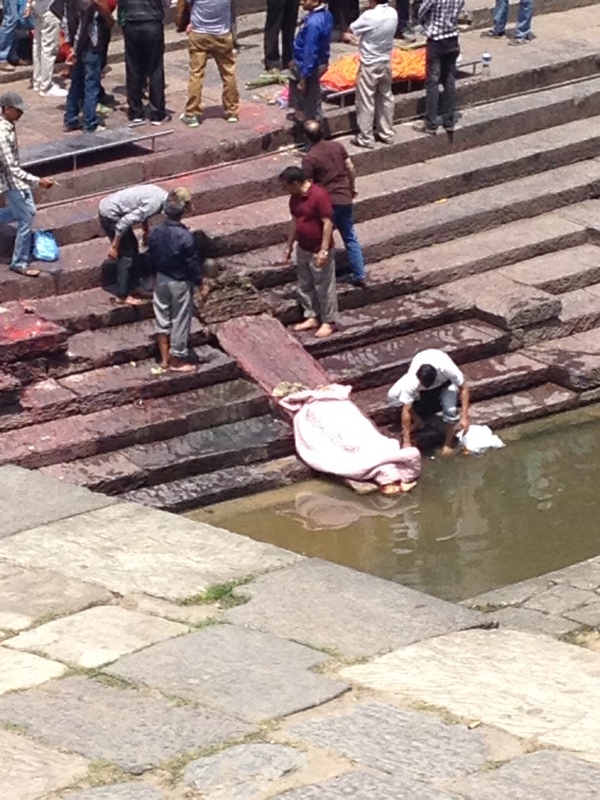 The location is necessary due to the ritual cremation of the Hindu dead whose ashes are then scattered into said river. 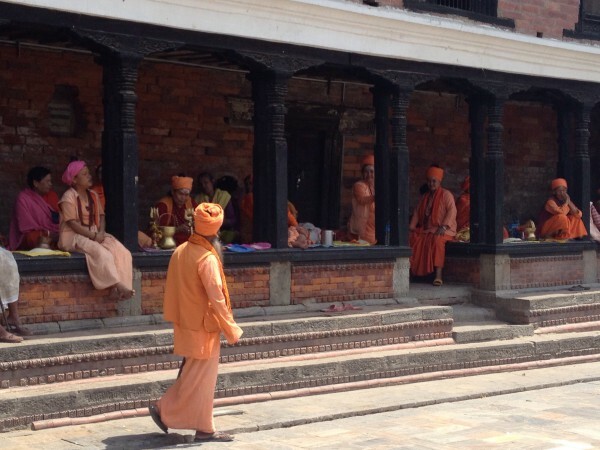 We entered the temple by the main entrance and already saw a couple of “gurus” in orange. 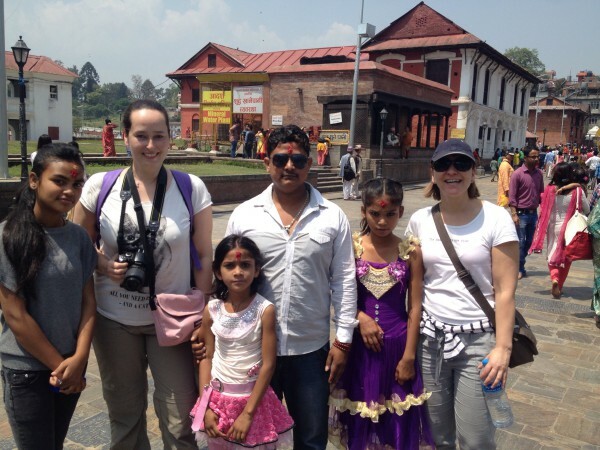 if you want to take their picture you have to pay for it. We saw a few more of these “holy men” and were told that some of them had taken a vow of silence. See for yourself how serious they take it. 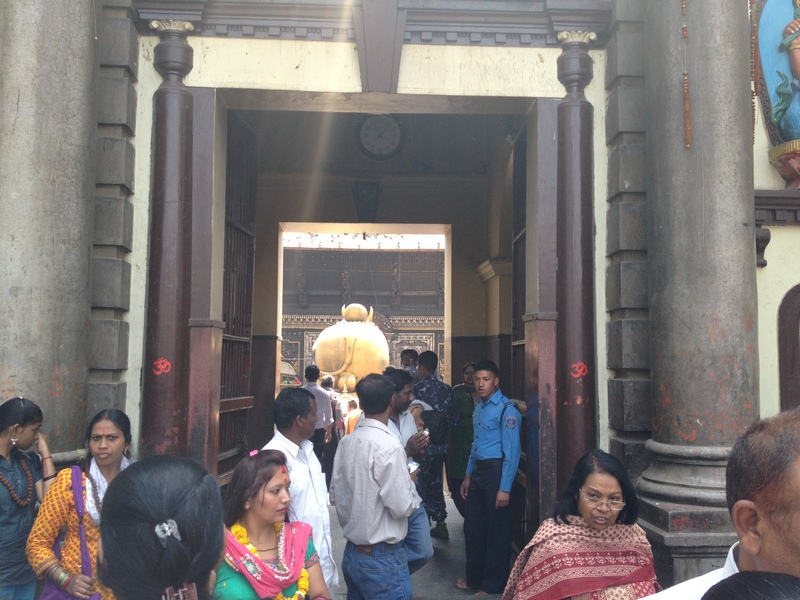 We made our way in front of the temple which we were not allowed to visit. 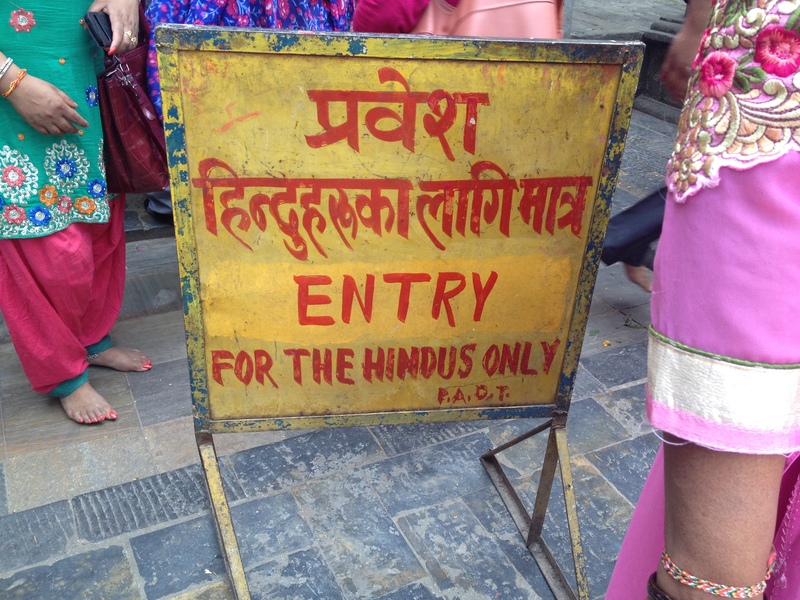 Entrance was only allowed for Hindus who had to leave all leather goods behind and were walking around barefoot. 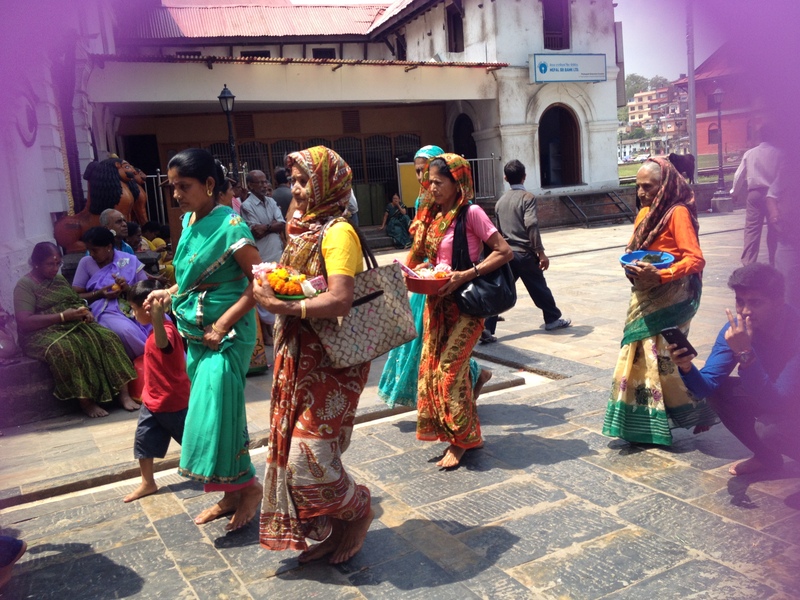 While for us the fervour of the praying Hindus was amazing so were we for them a spectacle to behold. 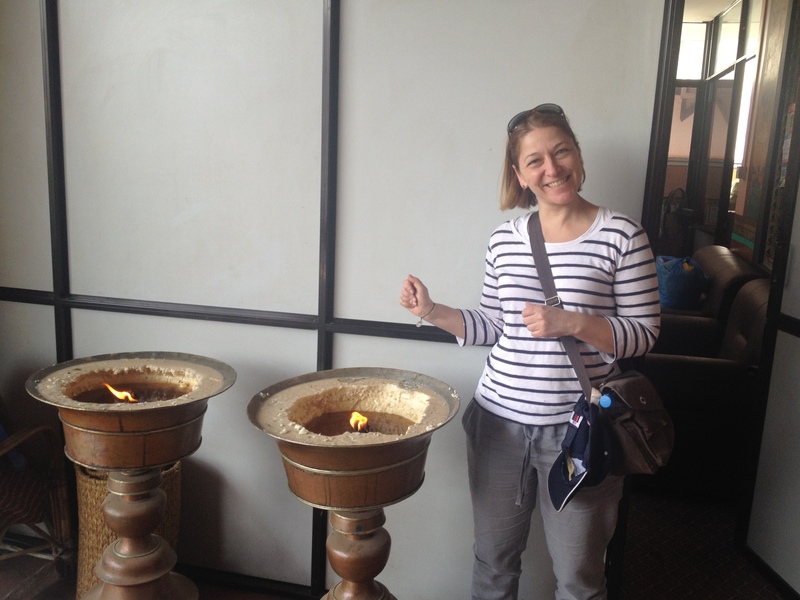 So funny to be the object of fascination, we were asked three times for our pictures. Sorry that I can’t show you the bare feet but our guide here for the two days managed to cut off our feet on all pictures. 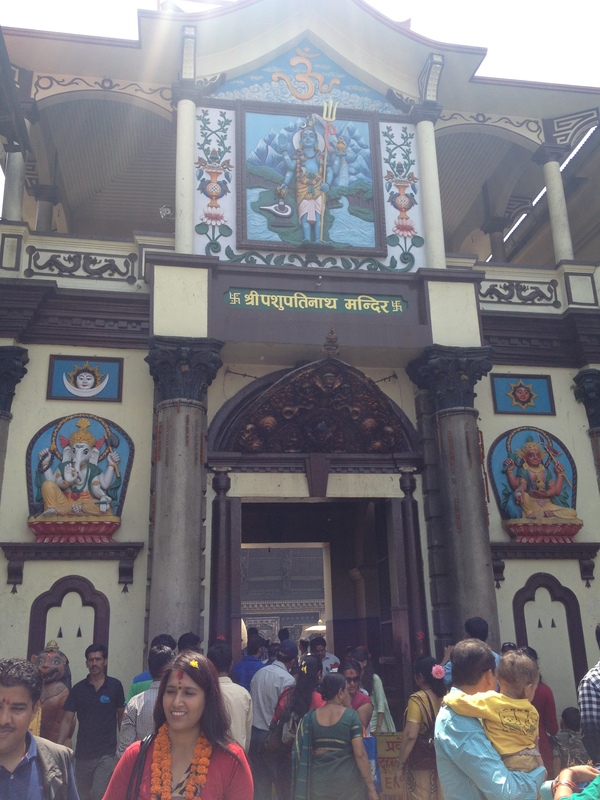 And here some impressions of the temple. Please note the goat! 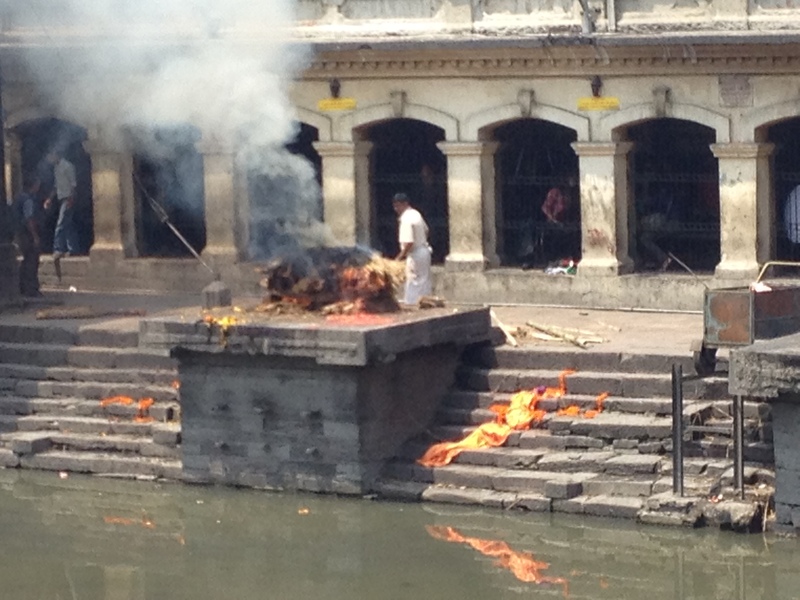 Slowly we walked from the temple to the river where the cremation area lay. 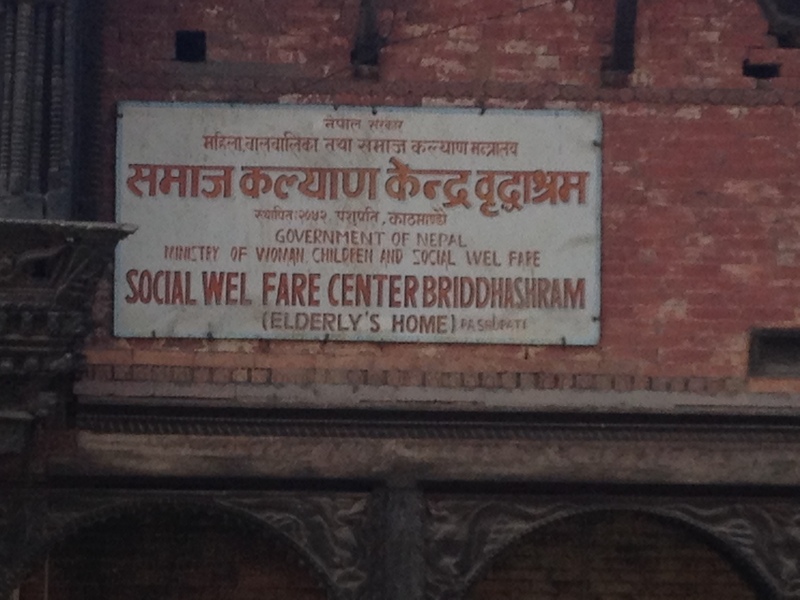 The complex was huge and included a retirement home. 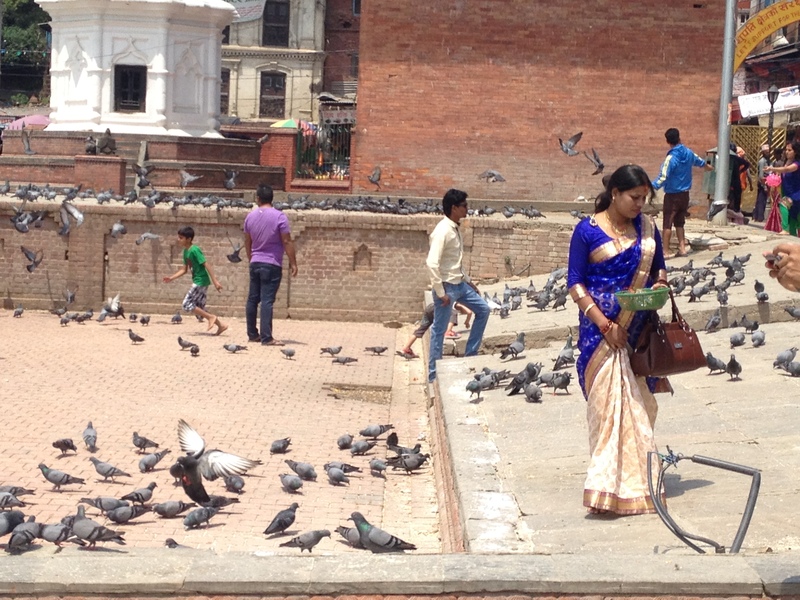 Lots of people were milling around, getting a red teeka or just took pictures in from of the doves. 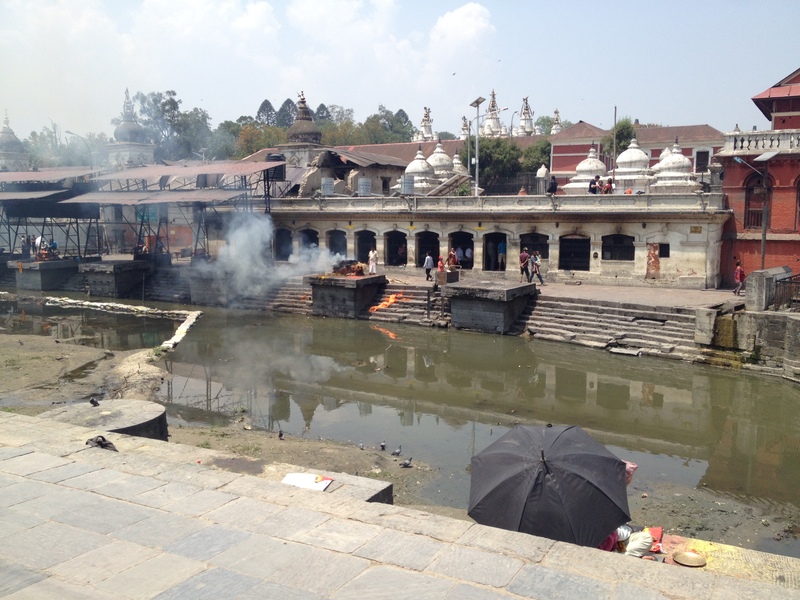 The cremation area was around the river Bagmati. 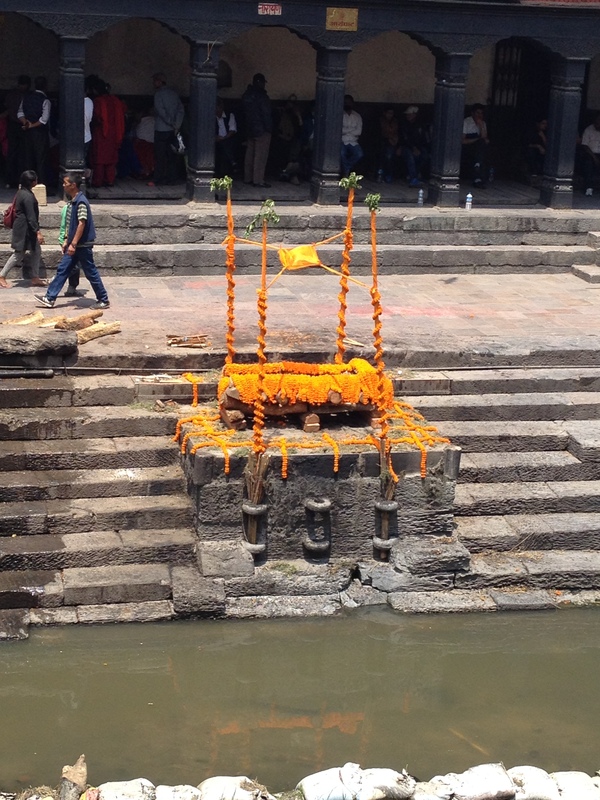 On the one side you have the cremation places, individual piles of wood on which the dead are placed and next to it, after the bridge you have the cleansing area of the dead. Cleansing is probably the wrong word. 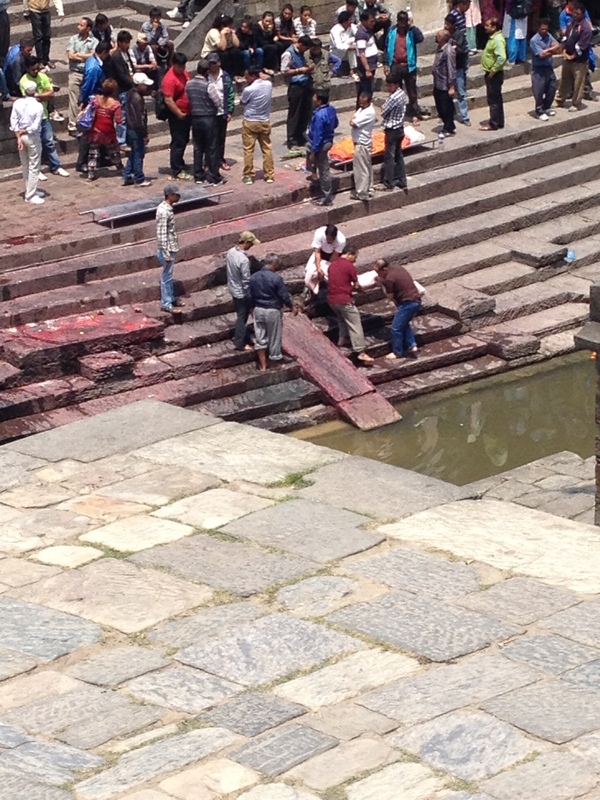 But as far as I understood in this area the dead are placed on a slab of stone with their feet touching the water. 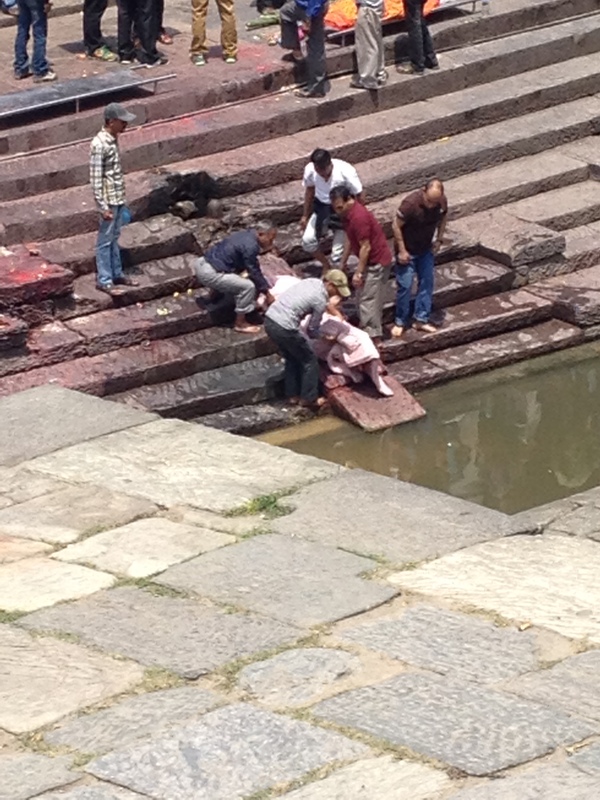 Also relatives will pour some more river water into the mouth of the deceased. 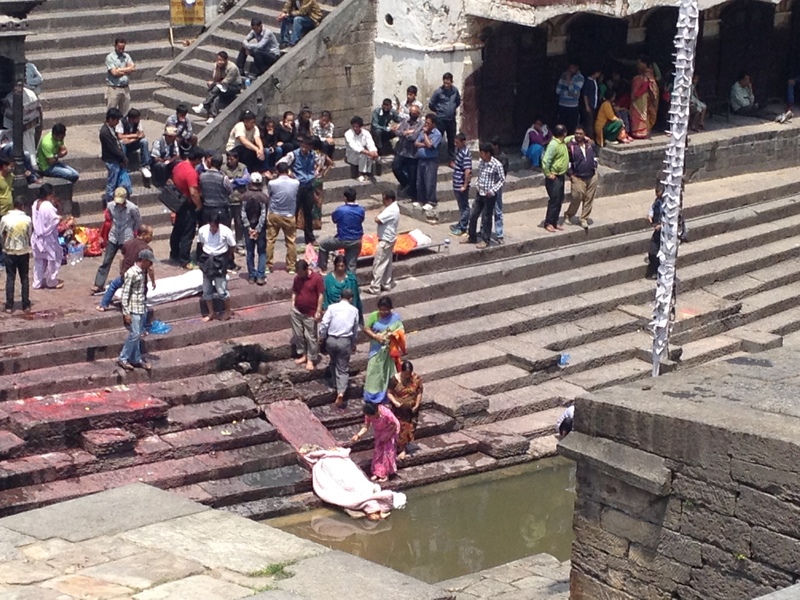 Here in this area the relatives are saying goodbye and through the water the soul leaves the body. So when the person is finally burned it is just his shell. Across from all this is the area for the spectators (and where I took the pictures from). 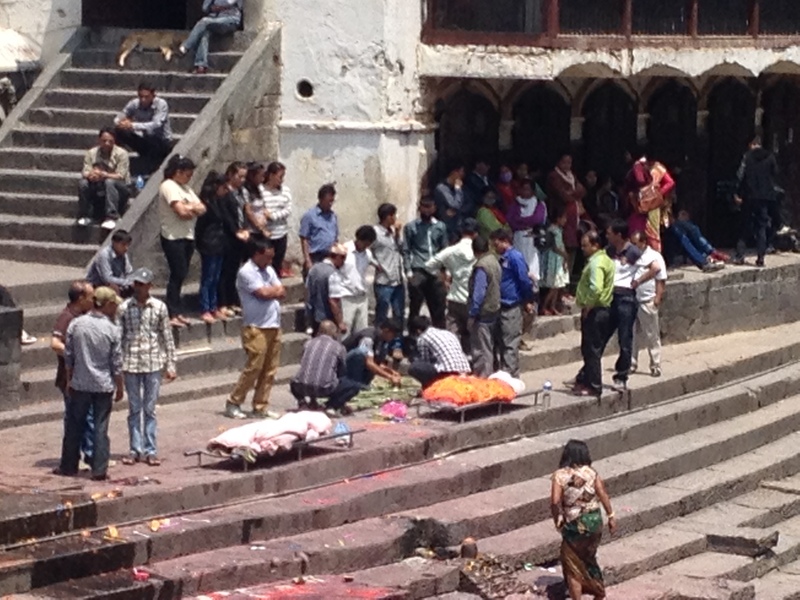 Not just tourists but also people praying and watching. A very public spectacle. 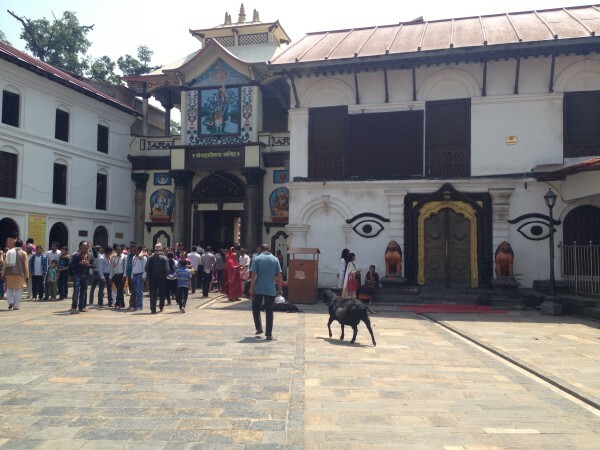 This entry was posted in Travel and tagged Bhaktapur, Boudhanath, Buddha Stupa, cremation, guided tour, Hindu, Hindu cremation ritual, Kathmandu, Nepal, Pashupatinath Temple, Teeka by Pollybert. Bookmark the permalink. 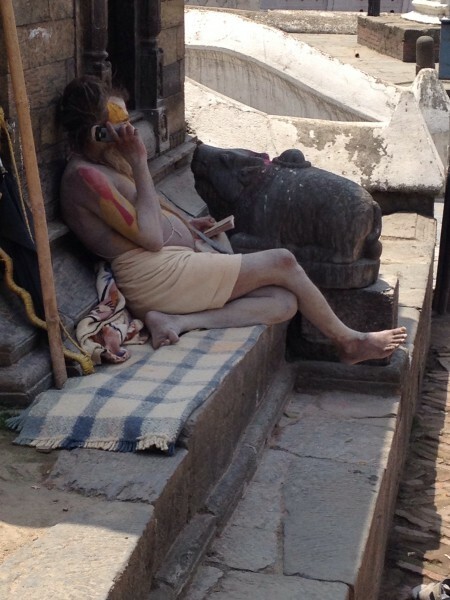 the holy man on his cell… priceless! 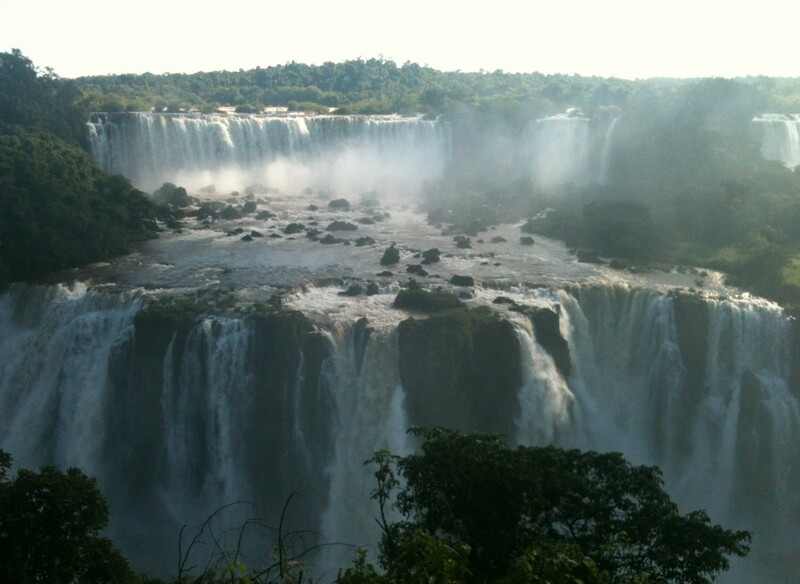 more great pics and a very interesting read. fascinating stuff!